You might be learning about sleep paralysis for the first time or you may have experienced it before. Either way, it is natural to wonder if sleep paralysis can hurt you. Can Sleep Paralysis Hurt You? Sleep paralysis refers to the sensation of being unable to perform voluntary movements either at the onset of sleep or upon awakening. Although many people have the feeling that the paralysis lasts an unbearably long time, in reality, these experiences tend to last just a few seconds. You might be learning about sleep paralysis for the first time or you may have experienced it before. Either way, it is natural to wonder if sleep paralysis can hurt you. While it may seem quite unusual and upsetting to someone who is not informed or experienced, it seems quite natural and positive to someone who has more multidimensional experience. Conventional-paradigm scientists also do not find sleep paralysis to be particular cause for concern, as it is a harmless, naturally-occurring state. In ancient times, sleep paralysis was feared and thought to be caused by negative spirits. The uninformed individual's brain will attempt to make sense of this circumstance by creating an imaginary interpretation based on cultural references. Some interpret a demon or evil spirit of some kind, like an old witch (or Old Hag such as in Medieval Europe), while others still envision an unfriendly extraterrestrial invader. Like many other cultures, the ancient Chinese reportedly believed that a person's soul was vulnerable to the influence of evil spirits during sleep when “ghost oppression” could take place. It is worth pointing out that other cultures, such as some Amerindian nations, would emphasize a more positive take on sleep, seeing it as a time when the mind was able to have visions and contact with Elders, discussing these experiences regularly. Other cultures have references to "the dark presser" (Turkey), "devil riding on your back" (Africa), "the crushing demon" (Hmong people of southeast Asia), “Kokma” attacks by the spirits of dead unbaptised babies (St Lucia), “Hexendruchem” or passing witches (Germany) and “Stand-stills” (UK). Even words for bad dreams bear witness to SP in different languages: pesadilla in Spanish or pesadelo in Portuguese refers to weight and nightmare or cauchemar in French refers to a mythological demon or goblin that torments others with frightening dreams. Clearly, the phenomenon is universal and as old as humans. Most people have feared the experience and have assumed it is negative throughout history. However, people also feared sea monsters before humans mastered the seas. Fear thrives in the absence of knowledge. With the rise of contemporary sciences, it was seen as a pathological condition correlated with narcolepsy. Today there is less of a tendency to label every phenomenon as a “condition.” Since sleep paralysis is fairly common and no more common among populations with particular illnesses, it is not likely to be an abnormal or even anomalous phenomenon. From a “multidimensional” paradigm perspective, academics who have multiple out-of-body experiences do not tend to fear sleep paralysis. They tend to understand that these two phenomena are natural, positive and interconnected. OBEs tend to replace fear of death and spirits with a de-mystified and less fearful attitude toward death and extraphysical entities. In fact, SP can be seen as a beneficial experience: a springboard to the OBE, a particularly good chance to experience life beyond the material dimension and enjoy all the introspective, inspiring, transformative and even altruistic opportunities presented by out-of-body experiences. 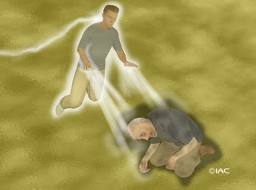 Paralysis is a natural part of the sleep cycle which prevents us from acting out our vivid dreams. Most of the time, you are not conscious awake to realize this while it is happening. However, once in a while, you do: this is what happens during sleep paralysis. It is common for those training to have OBEs, which includes remaining lucid as the body falls asleep or remains asleep, to experience SP. Naturally, SP and OBE are highly correlated. It is also natural that during this paralysis, if one panics, one would feel pressed down and experience some difficulty breathing deeply. However, this is not being caused by a negative entity, but our own physiology and our vivid imagination in a mixed sleep and wakefulness state. We can either wake up by attempting to move a finger or we can use this ideal state of deep relaxation to have a conscious projection or OBE. 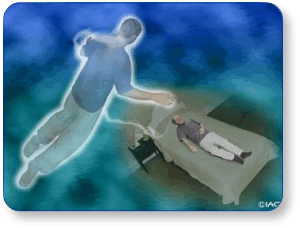 We know from experience and anecdotal accounts that it is not unusual, even in the attempt to move the body, one ends up moving the “astral” body. The scientific consensus is that these are natural, fairly common altered states. Hallucination may not be the most appropriate term to describe the experiences that accompany sleep paralysis. Multidimensional science sees them as windows into other levels and aspects of consciousness, as it is highly related to out-of-body experiences, which can aide self-knowledge and self-development. This is why SP is also referred to as projective catalepsy. Sleep paralysis is a harmless, common, and natural experience. It is normal to be scared at first, especially if uninformed about the phenomenon, as it has happened in many cultures throughout times. As we learn more about natural phenomena, we tend to demystify them and no longer fear them. Sleep paralysis is no exception. Conventional-paradigm and consciousness-centric scientists alike consider it a harmless and natural phenomenon. It could even become an exciting precursor to the out-of-body experience, which becomes very likely when one “goes with it,” rather than fight SP. Whether you see the OBE as a mere altered state or as a gateway to other realities, the OBE is largely seen as a harmless, healthy and potentially positive and inspiring experience. Contact the nearest IAC center to overcome fear of sleep paralysis and out-of-body experience with training courses in person and online.